This review presents an overview of the culture media and practices used in plant tissue culture and developmental biology. The compositions of the most commonly used basal media, especially Murashige and Skoog (MS) and modified MS (MMS), Gamborg’s B5 medium and B5 modifications, Woody Plant Medium (WPM), and Driver and Kuniyuki Woody plant medium (DKW) are discussed, along with typical basal medium manipulations to elicit and support various developmental responses. 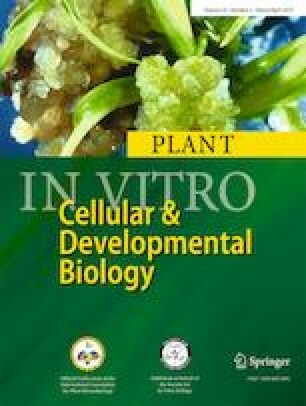 The most commonly used plant growth regulators and their applications to promote various developmental responses are examined, along with a presentation of the classical phytohormone developmental models for organogenesis and somatic embryogenesis. Elaborated developmental models for both organogenesis and somatic embryogenesis, with emphasis on discrete developmental steps, occasional need for multiple manipulations in culture to achieve a single developmental step, and identification of responsive tissue types in mixed cultures are explored. It is hoped that the information presented here will lead to a deeper understanding of basic tissue culture responses and will assist the reader in the decision-making process by identifying appropriate media and culture conditions for a particular species or application, or by providing a suitable starting point, should further customization be required. The authors thank Dr. John Finer for his encouragement and guidance for this article. The authors also thank the reviewers for their helpful comments.